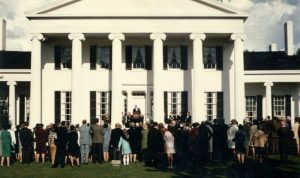 Rose Hill’s Dedication in 1968. Rose Hill Mansion opened as an historic house museum in 1968. Join us on Saturday July 21 for Rose Hill Through the Ages and celebrate fifty years of telling Rose Hill’s stories to the public. 12:00 pm – Curator John Marks will examine the history of historic preservation in the United States. 12:30 pm – Education Coordinator Alice Askins will explore the families who called Rose Hill home between 1890 and 1965. There will also be hands-on activities for all ages and special displays in the Mansion. Admission for Rose Hill Through the Ages will be the throwback prices of 1968! $1 for adults, $.50 for children 10-16, and $2.50 family rate for two adults and one or more children. Call the Historical Society at 315-789-5151 for further information about this event. Rose Hill Mansion is located at 3373 Route 96A, about a mile south of Routes 5&20, near Geneva.